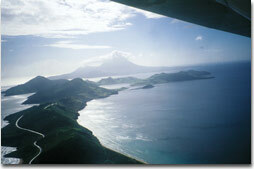 By air or by sea, you won't soon forget your first sight of Nevis. Its volcanic centerpiece, rising almost 3,300 feet above the cobalt Caribbean and usually shrouded in a wreath of clouds, is particularly dramatic when backlit by sunrise or sunset. It is mystical. Alluring. Like the abode of some powerful, mythical deity. Like Columbus, who named the island Nuestra Senora del las Nieves —Our Lady of the Snows—for its cloudscapes, Gail and I arrived by boat—a 40-foot Sunsail yacht, carried by the prevailing winds from Antigua some 50 miles to the east. This long approach gave us plenty of time to contemplate Nevis' exquisite profile as it rose slowly above the horizon, a Caribbean Bali-Hi. Our first close-up view of Charlestown, Nevis' diminutive capital, was from our anchorage offshore. We were greeted by the sight of the town's red roofs against the verdant fields and palm forests ascending gentle foothills. A lush rainforest embraced the summiit.